Skyline Queenstown (Queenstown, New Zealand) – The Southern Hemisphere's steepest gondola carries passengers from Queenstown to the top of Bob's Peak, 450 meters above sea level. Vanoise Express (Les Arcs, France) – To mark the 10th anniversary of the Vanoise Express in 2013, French tightrope walkers Julien Millot and Tancrede Melet crossed a 186-foot gap between two gondola cars. Titlis Rotair (Mount Titlis, Switzerland) – The Titlis Rotair is the world's first rotating gondola. The most spectacular part of the journey is the final and highest stretch, which cruises over one of Europe's largest glaciers. Stanserhorn Cabrio (Lucerne, Switzerland) – The Stanserhorn Cabrio is the first cable car to feature a roofless upper deck. It carries passengers 2,320 meters to the top of the Stanserhorn Mountain. The Ngong Ping 360 (Hong Kong) – It's the only gondola to offer two classes of cabin -- standard cabins are the cheapest option but the more expensive ones have glass floors. Palm Springs Aerial Tramway (Palm Springs, California) – Cruising to top of Mt. San Jacinto in Southern California, the Palm Springs Aerial Tramway has been providing high-desert thrills since 1963. Peak2peak Gondola (Whistler, Canada) – This gondola holds two world records. 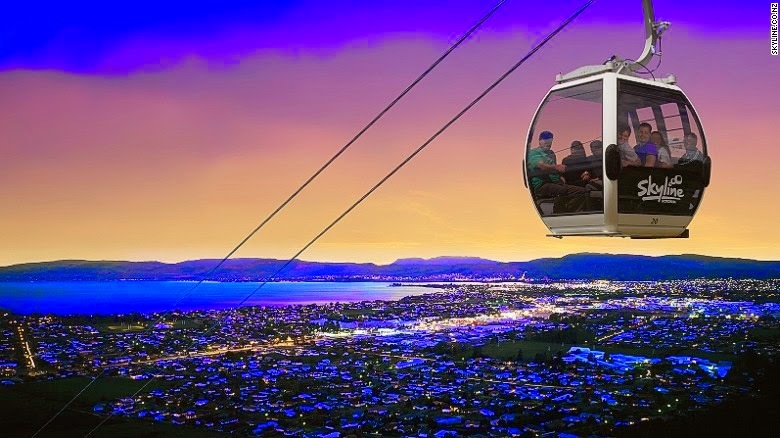 It's the longest free span between ropeway towers -- 3.03 kilometers (1.88 miles) -- and, at 436 meters, it's the gondola with the highest point above the ground. Mi Teleferico (La Paz, Bolivia) – Although its main purpose is to cut commuting times for local workers, Mi Teleferico is especially popular with tourists, thanks to fantastic views of the snow-capped Andes. Ba Na Hills Cable Car (Da Nang, Vietnam) – Opened in 2013, this is the world's longest gondola and stretches more than five kilometers long. Sugarloaf Mountain Gondola (Rio de Janeiro, Brazil) – More than 37 million people have ridden this Rio gondola since it opened in 1912.